John, son of Thomas & Mary Kemp was baptized at Barton Bendish 25th June 1830. Thomas Kemp, of Fincham, was given as Publican. Lot No 3 in sale of Fairswell Manor Farm (Lot 1) , The Manor of Fairswell (Lot 2), held Saturday 31st August 1844. 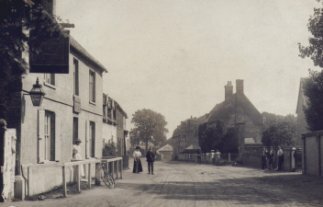 The Inn described as Freehold and free of brewery tie consisting of parlour and tap-room in front, with three sleeping-rooms over, bar, pantry and back kitchen, a large club-room, a Brew-office and other buildings. A four-stalled stable, Hay Loft, gig-house and Granary over. The whole being 1 rood and 11 Perches. Closure agreed at First Joint Committee Meeting of Bullards and S&P 29th May 1962. Sales given as 63 barrels of beer. Licensee given as aged 70, having been a tenant for 20 years.